The species has a widespread but patchy and scattered distribution in Britain. It is widespread in western and central Europe as far north as southern Norway. Principally a grassland and heathland spider with a penchant for shorter swards such as those found on grazed calcareous grassland, upland base-rich flushes or disturbed sites such as quarries. This habitat distribution in Britain agrees well with that found in central Europe (see Hanggi et al. 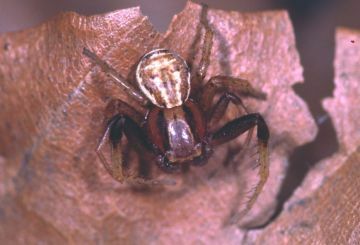 (1995)), although it may also be found in forests. In Essex the spider is only found in unimproved grassland or heathland (P.R. Harvey, pers. comm.). Adults are recorded from March to October, with a single female recorded in January. Coleman (1977) shows one peak in male activity in September, whilst Merrett (1967) shows peaks in June and September. Our data indicate two peaks, in the south in May and August/September, and further north in August and October.